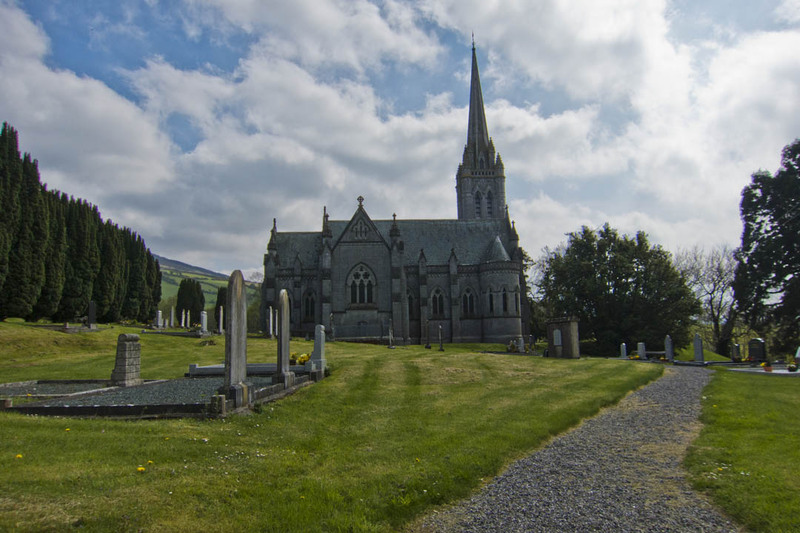 The village of Myshall, with Mount Leinster and the Blackstairs range towering above it, contains a surprise - a church that is reminiscent of Salisbury Cathedral. It was built by an Englishman, John Duguid of Dover, around the graves of his Wife and daughter. His daughter, Constance, was on holiday when she met a young man from a Carlow family, the Cornwall-Bradys, and fell in love. Tragedy struck when Constance was killed in the 1890s in a hunting accident. Her dying wish was to be buried in the old churchyard at Myshall in the land she loved, near the man she loved. Her father carried out her wish and raised a statue over the grave. Mrs Duguid died in 1903, and her last wish was to be buried beside her daughter. The distraught Mr Duguid decided to build a memorial church over both graves. He took Salisbury Cathedral as his model, redesigning it as a church. Fine craftsmanship abounds, from the Art Nouveau floor tiles and font to the muted greens, russets and silver of the stained-glass Windows. One of Myshall’s famous sons was Peter Fenelon Collier (1849-1909), the founder of Colliers Magazine, an illustrated journal weekly. He arrived in the United States penniless at the age of 16 and completed his education at a seminary. Starting with a borrowed $35, he was the first man to sell books on the instalment plan. Collier eventually built a publishing empire worth $12 million. Myshall is a real hidden gem that is worth a visit on your tours of Ireland.